Medical Tag from Childharness.ca. 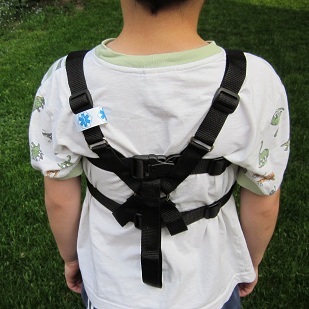 Medical tag to attach to the Child Harness or Special Needs Safety Harness from childharness.ca. Some older children with special needs may draw unwanted attention when seen in public wearing their new harness. Not everyone in our communities is familiar with those who have autism, ADHD, Down symdrome or other neurologic disorders that require them to wear a Special Needs Safety Harness when out with Mom and Dad or their caregiver or therapist. Our Universal Medical Symbol tag is a small but subtle means of informing those who look that your child needs to wear their harness to remain safe while out in public spaces. 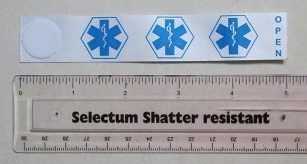 This small, cloth tag measures 3/4 inches by 5 inches and has printed on it 3 repeats of the American Medical Association's Universal Medical Symbol. The tag closes with velcro adhesive circles and can be attached to anything your child is wearing. Wrap the tag around their belt loop, the handle on their backpack, their lunch box strap, and of course one of the straps on their harness. The tag has 'OPEN' written on one end. You can write whatever details you like about your child on the inside of the tag. Use a black Sharpie marker or pen to record their name, your phone number, their blood type, their school bus number, anything that is relevant for your particular child. The tag is not intended to carry a record of their entire medical history, just the essentials. The word 'OPEN' at the end is a cue for caregivers to refer to information about your child that you have recorded on the tag. Our Universal Medical Symbol tags are intentionally small and easily transferable from the harness to items of clothing then back to the harness. It is printed in the same shade of blue as the familiar wheelchair parking permit signs and hospital signs. The colour of the tag and the symbol itself will inform those who see it that the harness is a necessary addition to your older child's wardrobe. Order multiple tags for the front and back of your Special Needs Safety Harness, or for other family members with allergies or medical issues.